In FotoMagico you can record audio directly to the Narration track. 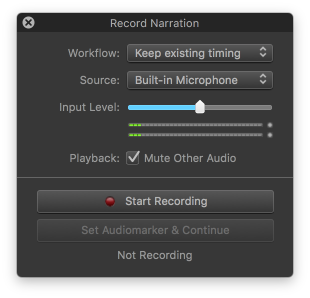 Select Record Narration Assistant… from the Slideshow menu to reveal the Record Narration panel. First select the desired workflow and input source (microphone). You may also want to adjust the input level of the selected microphone. Define new timing - Adjusts the duration of each slide as you speak. Whenever you click on the Set Audio marker & Continue button, a new audio marker is added to the recorded audio, the slide's continue type is changed to marker, and the slideshow advances to the next slide. Keep existing timing - Does not modify the existing timing while you are recording your narration. This is useful for slideshows that have already been carefully timed to music. Please note that you may have to adapt the length of your narration to the existing slide durations to make it fit. The Set Audio marker & Continue button will be disabled in this workflow. Select the desired audio input source (microphone) from all available devices. Adjust the input level to get a satisfactory recording. Mute other audio sources to avoid feedback during recording, unless you are using headphones for your audio output. Click on Start Recording to start playback of the slideshow at the current playhead position and record your narration. A new audio item will automatically appear in the Narration track. Click on Set Audiomarker & Continue when you are done narrating the current slide and want to advance to the next slide. This button is only available for workflow “Define new timing”. Click on Stop Recording to stop playback once you are done with your narration.